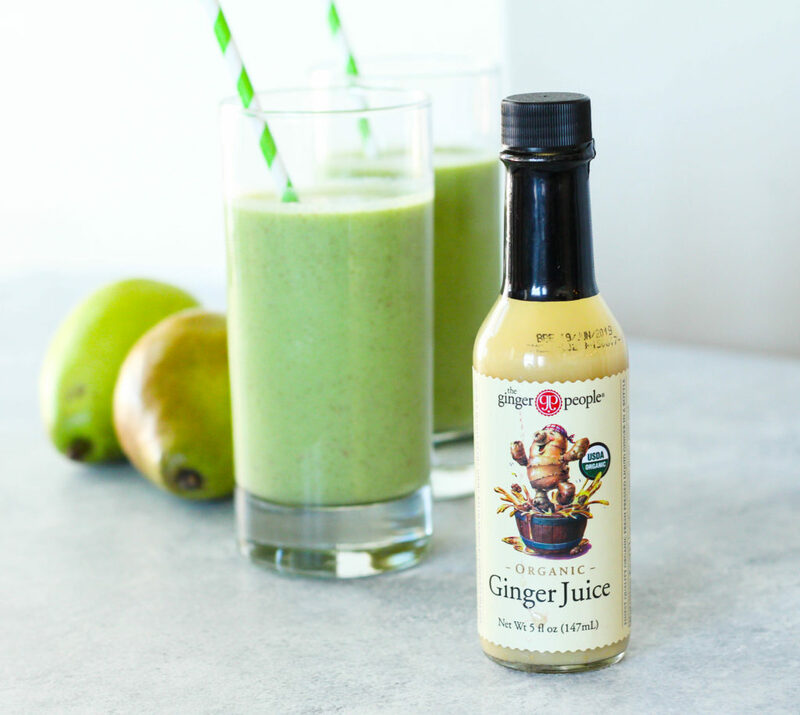 Crisp and sweet pears combine with tender baby spinach, Greek yogurt, and the zingy addition of juiced ginger. 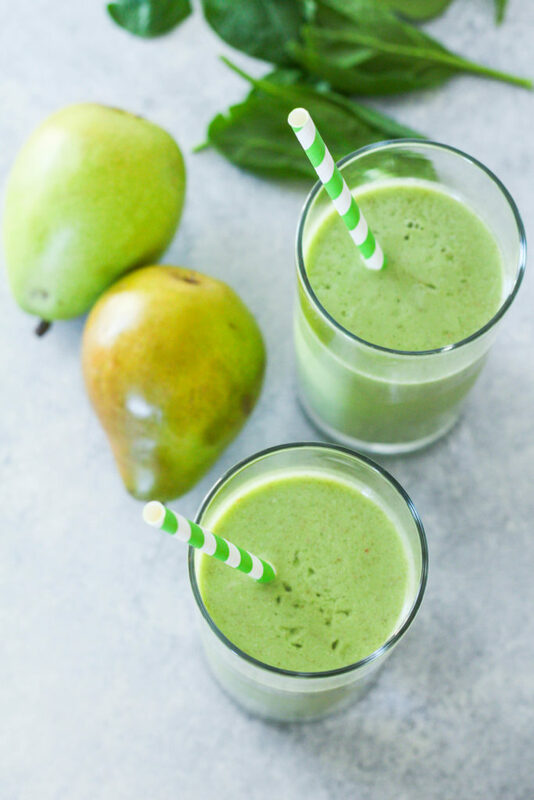 This Ginger Pear Smoothie is refreshing any time of the year! This post is sponsored by Sprouts Farmers Market. All opinions remain my own. Thanks for supporting Zen & Spice! Alright — the first recipe of the new year! I hope you all had a wonderful holiday. We hosted our first Christmas Even and Christmas day dinner. Both of our families came over which was awesome. After a ton of heavy meals, my body is craving fresh and juicy produce. One of my favorite ways to include more fruits and veggies: smoothies! I feel like we often forget about pears. Or maybe it’s just me. When I was little, I actually hated pears. I thought they tasted like sand. Only as an adult I finally started to appreciate them! Now I love their crisp and pleasantly sweet flavor. You may see Bartlett pears this month in the produce aisle. They’re in season until the end of February– you can recognize them by their green skin with a slight rosy hue. Bartlett pears are great by themselves, atop a garden salad, or served with slices of cheese as a snack. Any recipe that calls for apples can be made using fresh pears. I love using them in smoothies– they add that simple sweetness and a nice creamy texture. 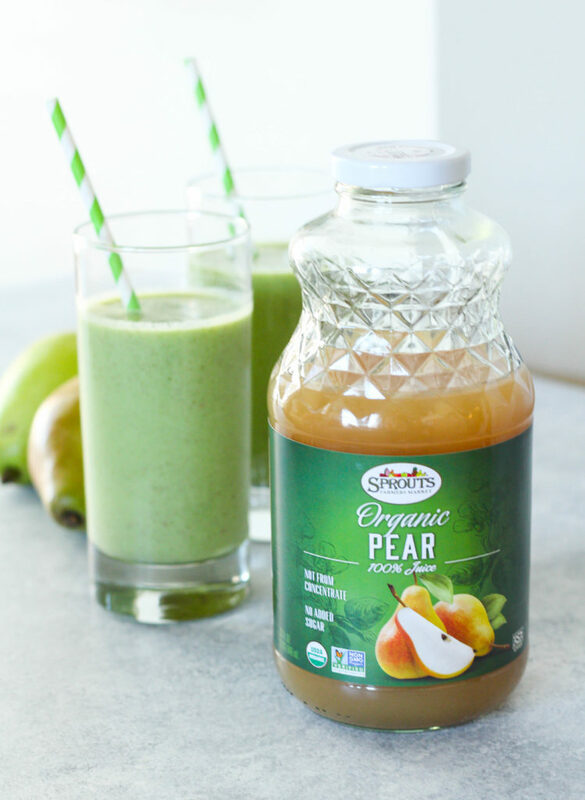 In today’s recipe, I also used pear juice that I got from Sprouts. It’s not from concentrate and acts as a delicious base for the smoothie. Something different than the usual smoothie base of orange juice or milk! My friends over at The Ginger people kindly sent me a gift box full of ginger goodies that included this ginger juice. I only had to use one teaspoon for my smoothie and the juice gave it a wonderful zingy flavor. Much easier than peeling and slicing fresh ginger for a smoothie! I used my Vitamix to make this smoothie. I really love this blender — it has a touch screen and it’s easy to clean. 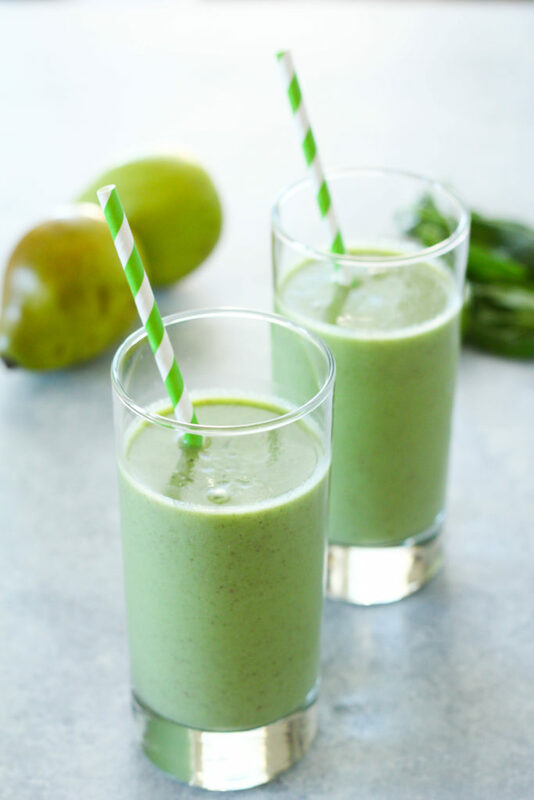 Switch up your normal smoothie routine and add something different. 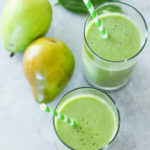 Pear and ginger aren’t used often and it creates a delicious, refreshing drink! Add all ingredients to a high power blender. Blend until smooth. Adjust honey and ginger juice to taste.